Learning the ins-and-outs of how to tune your instrument and knowing the differences between each ‘ukulele tuning is one of the most important things to work on when you’re beginning. Ensuring you are in the correct ‘ukulele tuning will make a world of difference in what comes out of the ‘ukulele. If it’s off just a little bit, music you play won’t sound very nice. Why won’t my ‘ukulele stay in tune? The G-string is closest to the ceiling and is called the 4th string. The A-string is closest to the floor and is called the 1st string. The C and E-strings sit respectively between. The G-string can either be a “high-g” or a “low-G”. A low-G is a more contemporary sound and is tuned to the G below middle C which keeps the string in an ascending order: low to high (called “linear”). 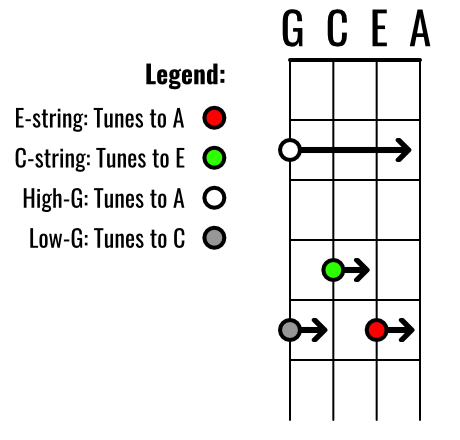 More information on low-G strings. The interval distances between the strings are: a perfect 4th (G to C), a major 3rd (C to E), and a perfect 4th (E to A). There are several different ways you can tune your ‘ukulele. Each has its pros and cons and can be used in different situations. Learn one that will aid you in everyday playing and become your go-to method for ‘ukulele tuning, but also study the others so you have options and alternatives in case your tuner breaks. The old-school way of tuning (and arguably best) is to pitch the strings relative to each other. You use your ear to match the pitch of one string to the next. This often yields a sweeter tuning because it will be adjusted to what sounds best to your ears. A clever person would start by tuning one of his ‘ukulele’s strings to that of his friend’s and then tune out from there. Tune everything to your bottom A string. If you are going to use a reference pitch, be sure you tune your A string to it. 1. Hold the 5th fret of the E-string. This should exactly match the sound of the open A-string. Play both E and A-strings simultaneously and adjust the E-string’s tuning peg until it’s the same pitch as the open A string. With geared tuners, turning the peg clockwise will loosen the string. Turning counter-clockwise will tighten it. This is true for standard or slotted headstocks.As long as you are looking down the tuning peg the orientation will be the same. With friction tuners, turning the peg clockwise for the top two strings and counter-clockwise for the bottom two strings will tighten the string. 2. Now hold the 4th fret of the C-string. This should exactly match the open E-string. Play both C and E-strings and adjust the pitch of the C-string so that it matches the pitch of the open E-string. Hold the 2nd fret of the G-string. This should exactly match the open A-string. Use the ‘ukulele tuning pegs to adjust the pitch of the G-string so that it matches the pitch of the open A-string. Hold the 5th fret of the G-string. This should exactly match the open C-string. Use the tuning pegs to adjust the pitch of the G-string so that it matches the pitch of the open C-string. When you play two of the same notes simultaneously (like the 5th fret, E-string to an open-A) and they are a bit out of tune, there is a “beating” sound that happens. It’s like a pulse; kind of hard to hear. The further the two notes are out of tune, the faster and more noticeable the beating sound. If your two notes are perfectly in tune, it goes away. You can listen for this to get your unison notes very close in pitch, but it takes some practice. By verifying your tuning several different ways you can get the strings even closer to the proper pitch. One of my favorites is playing the octave C with the open C-string and 3rd fret, A-string and also the octave G on the G-string and 3rd fret, E-string. If you play high-g your octave G will be a unison, but will serve the same purpose. Since you are skipping a string you have a chance to get the overall temper in tune better. If you tune to the A-string and work up, any error is reflected in the following string. By cross-checking the tuning in this way you can eliminate the possibility of these long-range, accumulative errors. Another trick is to play harmonics on the two outside strings on the 5th and 7th frets. By matching these two high pitches you can hear the beating effect discussed above better. 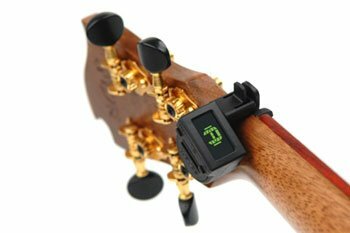 The second method of tuning your ‘ukulele is to use an electronic clip-on tuner (I like this one). This is the simplest assisted way to tune. Because a clip-on tuner “feels” sound vibrations, you can tune in a roomful of noise without any trouble. 1. Turn the tuner on and clip it to your ‘ukulele’s headstock. 2. Play an open string. The tuner displays the pitch of the note you are sounding. 3. If the indicator is to the left of center or below, the pitch of the string is flat and needs to come up (higher), if it is to the right of center or above, the note is sharp and needs to come down (lower). When the indicator is centered, the string is in tune. Unfortunately, many tuners these days come with lots of options and settings that can be very confusing at first. Most tuners have guitar, uke, and chromatic modes. The guitar and uke modes limit the display to only showing those notes in the tuning. This means if your G-string is at an F# note, the tuner shows “G,” which is the closest in pitch. To me this is confusing, which is why I prefer to set my tuners to the chromatic setting. This way I can see all the notes and always know exactly where I’m at on the spectrum. The reference pitch is also usually adjustable. Unless you have a good reason for changing it, this should always be set to 440hz. If you’re accidentally at 336hz and everyone else is at 440hz, you’re uke is going to sound off. I use a Planet Waves NS Micro. It’s amazingly small and accurate. There are actually many ‘ukulele tuning apps. I used Cleartune ($3.99) for a long time on my iOS devices, but recently I’ve been rocking the BOSS Tuner. It’s free and seems to track better than Cleartune. 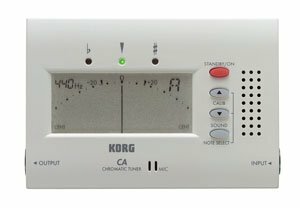 The other option here is a standalone tuner like the Korg CA-50. This is what comes with many starter ‘ukulele packages. It features a virtual needle and a little microphone to hear your uke. Both apps and the standalone tuners follow the same principles as clip-on tuners to guide you into pitch. You pick a string and the note is displayed. If the needle floats to the left, the note is flat and need to go higher in pitch. If the needle floats to the right the note is sharp and needs to be lowered. A common problem beginners have when trying to tune their uke is that it simply won’t stay on pitch. This is frustrating because even though you get the string to the right note, you can’t play any nice-sounding music for very long – or at all – because it quickly goes out of tune. Some ‘ukuleles simply stay in tune better than others. I had a low-budget Hula Ukes ‘ukulele that I had to tune all the time. My Moore Bettah on the other hand rarely goes out of tune. Instrument stability has as much to with it as the strings. If you have a uke that has joints and parts that shift around when the temperature changes, naturally the strings will drift out of tune. A huge percentage of the time, strings slipping can be attributed to incorrect installation. The string doesn’t exert enough friction on itself and actually slides through its hole in the tuning peg. The string is wrapped around the tuning peg many more times than it needs to be and extra slack hidden in the winds slowly releases over time. Unless you are on a very tight budget, I always recommend replacing stock strings ASAP to avoid these problems. You’ll also find that new strings sound better than their counterparts that have been sitting in a warehouse for months or years. New strings or strings that are affected by #2 above often need to have the slack stretched out of them. Friction tuning pegs that stick straight back from the headstock often loose their grip on the hole they live in. This leads to endless down-tuning that’s caused by the peg actually turning in its hole. Most friction pegs have a screw on the back that you can tighten with a screwdriver. Adjust this small amounts at a time until the string stops falling flat. Over-tighten the screw and it will be hard to turn the peg at all! A popular alternative to traditional friction pegs are Gotoh planetary geared tuners. They preserve the look of the straight-back style, but have a 4:1 ratio for more precise tuning and are less prone to slipping. The way you approach getting your strings to pitch has a lot to do with how well the uke stays in tune. You always want to tune up to the desired note. This prevents unwanted slack from being trapped between the nut and tuning peg. Since a nut slot isn’t a perfectly slippery surface, the tension difference between the reverse side of the string and the side that you play on are rarely equal. If you tune down to a note, the tension of the long, ringing length of string will be higher than that of the short, unplayed portion. As you play, the weight of your fingers on the frets will even out the tension between both sides of the string, causing it to go flat. Standard (GCEA) and baritone (DGBE). Baritone tuning is the same as standard, only it’s tuned down a perfect 4th lower to a G6 chord. This is the same as the bottom four strings of a guitar. The other main variant is the D6 tuning. This tuning is A D F# B and is a whole step higher than standard. It’s common in England, but also in Canada where D6 is the tuning often taught in schools. Any ‘ukulele can be tuned to almost any tuning, but you have to be careful with the gauges of strings you use. According to D’addario, a standard high-g tenor set tuned to G C E A exerts 49.61 pounds of tension on the ‘ukulele. Changing the tuning up to A D F# B jacks the tension up to 62.62 pounds – a 23% increase. This is playing with fire in my book so a tool like String Tension Pro is invaluable for figuring out safe tensions across different tunings and scale lengths. An open-C slack-key tuning is really the only variation that has any kind of following. It’s nice because a straight barre across the fretboard becomes a major chord. This makes it easy to play certain Hawaiian style runs with. You can tune any ‘ukulele to slack key without changing strings. Simply lower the pitch of the A-string a whole step down to G.
I’ve been playing solo a lot recently and usually fell like my sound is thin when playing in standard tuning. It IS just a uke and a voice, after all. So I began looking around for alternative ways to sound “bigger.” It occurred to me that many of the great guitarists tune down a half step to Eb. On an ‘ukulele it’s a B6 tuning: F# B D# G#. The moment I tried this on ukulele I knew I was on to something. The sound was fatter and had a nice deep ring to it. It really brought out a dark vibe in my ukulele that I really liked the sound of. And it sounded more ballsy on its own. More about tuning down a half-step. When an ‘ukulele has more than 4 strings things can get confusing really fast. Six-string: G – high-C – C – E – low-A – A. This is interesting because a six-string has the lowest string paired with the highest string. The sound is unique and rich. Eight-string: G – low-G – high C – C – E – E – A – A. The E and A-strings are tuned in unison – the same pitch. Guitalele: low-A – low-D – low-G – C – E – A. Tuned like guitar with a capo on the 5th fret.